Baby Costs > How Much Does a Baby Crib Cost? How Much Does a Baby Crib Cost? It’s no doubt that one of the most essential pieces of furniture for a baby is the crib. A crib is usually used until the child is about 3 years old, depending on the maturity of the child and the setup of your home. Since you will be using the crib for a long period of time, even longer if you plan to have more than one child, it is important to choose your crib wisely. The average consumer will spend $150 to $800 on a baby crib. The price can vary depending on the type of material used to build the crib, the design, the brand, type of crib, the retailer, and if any extra features are included such as a drawer or the ability to convert to a bed. Refer to our table below to see what popular cribs cost. Usually, the fancier you want it, the more you’re going to pay. A basic crib made from composite wood materials, such as the Graco Lauren Classic Crib, will cost $150-$200. A basic convertible crib, which converts easily to a twin-size headboard and frame, will cost about $200-$400. For example, the DaVinci Kalani Convertible Crib will cost about $250. A specialty crib, such as the Europa Baby Palisades, can cost up to $1200. Babble.com notes you could spend up to $2,000; it all depends on how fancy you want to get. A standard crib will come with four set sides and slates. While these cribs may be standard, it doesn’t mean it will be plain and boring; in fact, they come in many styles. These cribs tend to be no-frills and will be the cheapest option. These cribs are designed to grow with your baby. A “convertible” crib can do just that — it will convert as your baby grows old. This means the crib can eventually turn into a toddler or daytime bed. Pay close attention to the name of the crib since this will give you an indicator at how many times it can convert. For example, a 4-in-1 convertible crib can convert four times. These beds can last most of your child’s life and will tend to be the most expensive option. A portable crib allows you to move the crib easily from one room to another. This crib can fold and will have wheels at the bottom to allow you to slide it anywhere you wish. These cribs are a nice idea for homes with limited space and even allows you to bring the baby anywhere you are in the house. A travel crib is designed for those who want to take their crib on the road. This crib can fold up and can be easily stored in a to-go bag. Usually made of aluminum, most well-made cribs can be set up in less than a minute. This type of crib is more than a crib as it will usually include a piece of furniture built into it. This may include a changing table or even a dresser. This type of setup works well for those who have limited space and don’t want to have furniture laid out everywhere. Common finishes may include black, cherry, dark, espresso, gray, natural and white. Most cribs will be made from either wood, metal, plastic or a fabric-type material. Cribs can come in all sorts of sizes; however, the standard crib size is 52 by 27.8 inches. All cribs should come with an adjustable side rail and adjustable mattress height. A manual with assembly and usage instructions will be included. Name brand cribs will come with a limited warranty that can last upwards of 10 years. When purchasing a crib, make sure that the crib meets the government’s minimum requirements. To educate yourself on the safety regulations of a crib, visit the Consumer Product Safety Commission – and be sure the crib you choose follows these regulations. If purchasing a crib used, always be sure to check the recalls from the past as some sellers are either misinformed or may try to sell hoping the buyer won’t do the necessary research. Two of the most common cribs will either come with a drop-down gate side or a side that is permanent. Drop-down cribs are now illegal because of safety standards, so be sure to stay away from these types of purchases. Research the crib’s height and weight maximum. If you plan on using this crib throughout your child’s first two years, it’s essential to consider a crib that will hold a toddler’s weight. Compare at least three different brands through various stores in store as well as online. Major retailers such as Babies R Us and Buy Buy Baby have a good selection to choose from. It’s best to plan ahead. Try to make it a goal to purchase your crib during your third trimester. Measure the amount of space available in the baby’s room. You will want to make sure you’re getting a crib that fits comfortably. 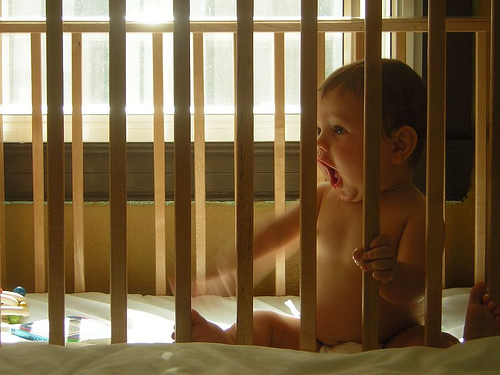 The distance between the crib’s slats should be no more than 2 3/8 inches wide. A crib mattress will be necessary as well. These crib mattresses must also meet the standards of the CPSC and can range anywhere from $50-$200. For example, the baby Sealy posturpedic mattress will cost $100. In addition to the mattress itself, a mattress pad will also be necessary. Most people choose to buy at least two mattress pads so they do not have to rush to do the laundry between bedtime and nap time. Mattress pads cost $10-$20 each, and these pads should fit snugly and be waterproof. A bed set, which usually includes a sheet, comforter, blanket, and bumper pads, can cost $50 to $200. Crib sets are commonly found with designs such as zoo animals or characters. A crib tent is ideal for older toddlers to ensure that they can’t flip out of the crib when they get older. Crib tents can cost anywhere from $35 to $80. Since most cribs need to be assembled, you could leave it up to the store or a professional to do the dirty work for you. Most assembly jobs will cost $100 to $200. While optional, many parents opt to purchase a teething rail that can be placed on the crib’s rail. Since most cribs are made of wood, the last thing you want to have happen is see your child get a splinter from teething on the wood. Remember, this rail will be mouth level with your baby as they begin to stand up. For those on a budget, using websites, such as eBay or Craig’s List, can help you find a nice used crib. It is suggested that you purchase your own new mattress and mattress pad. When looking at a used crib, pay close attention to the condition. If it seems like it has a lot of wear and tear, it could potentially be unstable for your child. If shopping with a retailer, check for coupons online. Retailers, such as Babies R Us, commonly have coupons that can help save 20% off an item.